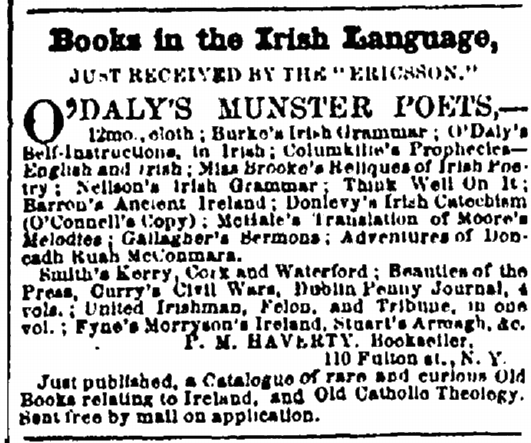 Advertisement for Books in the Irish Language, New York Irish-American Weekly, 29th August 1857. Evidence that there was demand among members of the Irish community in the United States for writings in their native-tongue in the immediate Antebellum era (GenealogyBank). 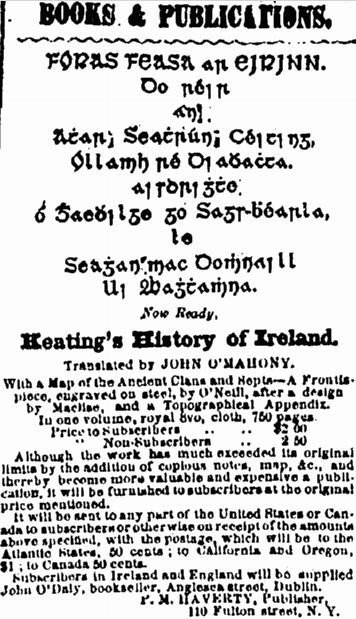 An advertisement for John O’Mahony’s translation of Keating’s History of Ireland from the New York Irish-American on 29th August 1857, the first year in which Gaelic typescript was used in an American newspaper (GenealogyBank). 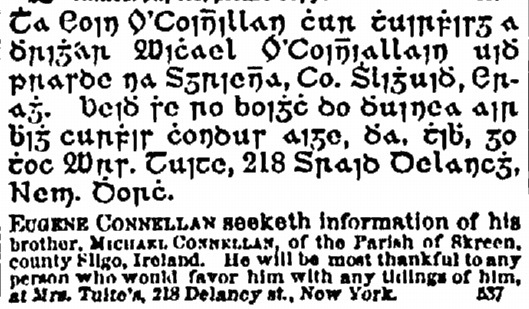 The bilingual “Information Wanted” advertisement seeking details of Eugene Connellan (Eoin O’Coińillan) from Sligo. 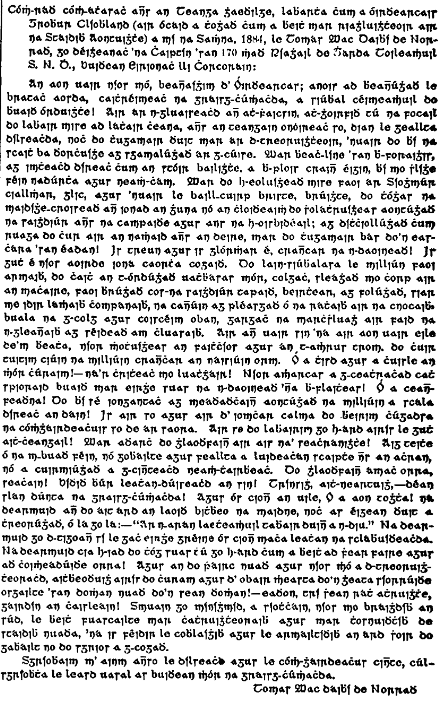 New York Irish-American Weekly, 28th February 1863. Evidence that many of the ordinary New York Irish preferred to communicate in their native tongue (GenealogyBank). 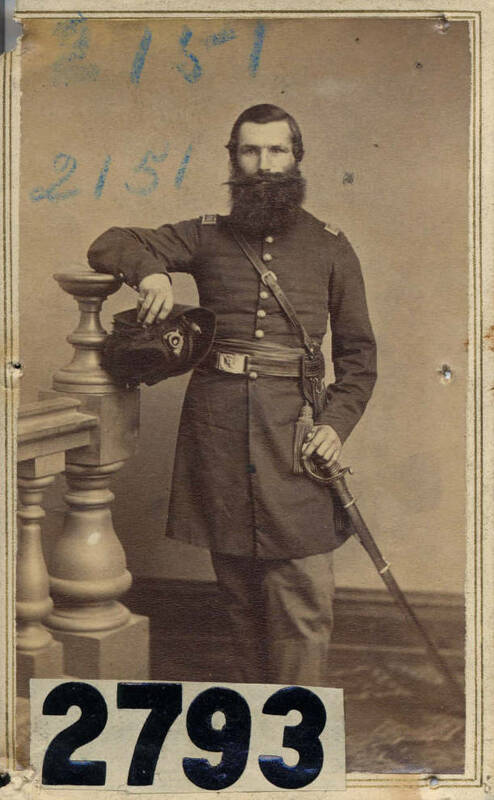 Captain Thomas David Norris, 170th New York Infantry, Corcoran’s Irish Legion, and veteran of the 69th New York State Militia at the First Battle of Bull Run. Perhaps the most major advocate of the Irish language to serve during the American Civil War (New York State Military Museum). Cherry Street, Manhattan, as it appears today. In 1865 Thomas Norris opened a Saloon here, presumably a location where hearing the Irish language spoken was commonplace. The address presented by Captain Norris to President Cleveland at The White House on the day following his inauguration. 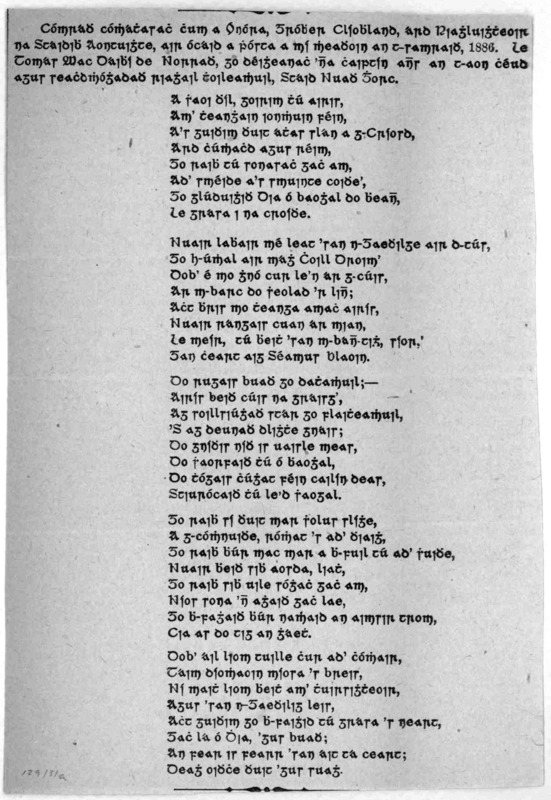 Reproduced in the New York Irish-American on 21st March 1885 (GenealogyBank). (1) Gallagher Pension File; (2) Miller 1985, 580; Nilsen 1996, 254; (3) Nilsen 1996, 258; New York Irish-American 18th July 1857; (4) Nilsen 1996, 263; New York Irish-American 28th February 1863; New York Irish-American 22nd April 1865; (5) O’Grady 1902, 511; (6) Nilsen 1996, 265; (7) New York Irish-American 20th January 1900; New York Irish World 27th January 1900; New York Irish American 19th August 1865; 170th New York Roster; (8) New York Irish World 27th January 1900, New York Irish-American 4th February 1888; New York Irish-American 21st March 1885; Library of Congress American Memory: Congratulatory Address to Grover Cleveland; (9) New York Irish-American 20th January 1900; New York Irish World 27th January 1900. Dependent Children’s Pension File of Farrigle Gallagher, 13th Pennsylvania Cavalry, Company B, WC109448. New York Irish American Weekly. Roster of the 170th New York Infantry. A Congratulatory Address to Grover Cleveland President of the United States. On the occasion of his marriage, in June, 1886, By Thomas D. Norris, late Capt. 170th Regt. New York Volunteers. Library of Congress Printed Ephemera Collection, Portfolio 129, Folder 31. Miller, Kerby A. 1985. 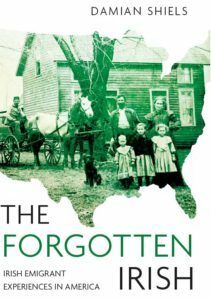 Emigrants and Exiles: Ireland and the Irish Exodus to North America. Nilsen, Kenneth E. 1996. “The Irish Language in New York, 1850-1900” in Ronald H. Bayor & Timothy J. Meagher (eds.) The New York Irish, 252-274. O’Grady, W.L.D. 1902. “88th Regiment Infantry” in New York Monuments Commission for the Battlefields of Gettysburg and Chattanooga, Final Report on the Battlefield of Gettysburg, Volume 2, 510-516. New York State Military Museum Carte de Visite for Captain Thomas Norris. Another aspect of Irish emigration that is sometimes overlooked. One wonders if the efforts of Tom Norris had an influence on the Gaelic revival movement in Ireland. Damian: another vignette to add. In Feb 1862 Confederate prisoners from Ft Donalson were brought to Camp Douglas in Chicago. Many were native Irish and Irish speakers. Their guards were soldiers of Mulligan’s Irish Brigade (23rd Illinois). The men on the walls and the men in the pen soon realized they had the Irish language in common. About 50 southerners joined Chicago’s Irish Brigade. Thanks for that great bit of information! I knew many of the Confederate Irish eventually joined the 23rd, but had not come across the Irish launguage connection. It is a really fascinating aspect of the Irish experience. Sullivan O beau prior to the next battle of the Civil War, is so meaningful. God Bless and protect them all, as so many fought in Civil War and others also.